I was asked to look at a timber wall in a recent barn conversion. The owners had identified an issue with stains bleeding through the oil based satin which had been applied by the builders carrying out the conversion. On inspection it appeared that the timber had been treated many years ago. Unfortunately the builders had not primed the timber with a suitable product to stop the previous treatment coming back through. The rest of the walls in the room were regular plaster and the home owner wanted the same colour and finish on the timber. 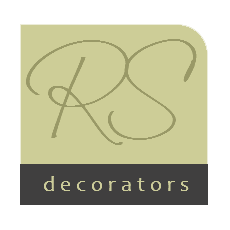 It was also in the specification that water based paints be used, to prevent the solvent smell which is present on some stain blocking products. The Gear for the job! Some of the best primers and stain blocking coatings are made by Zinnser. For this type of stain the best product is Zinnser Bullseye Plus. Its water based, quick to apply and does not have any lingering smell. The timber surface was very uneven as you would expect in a barn conversion so sanding would have been very time consuming. The Bulls Eye Plus primer will adhere to clean surfaces even if they have not been sanded. To clean I used Virosol citrus cleaner and rinsed well. 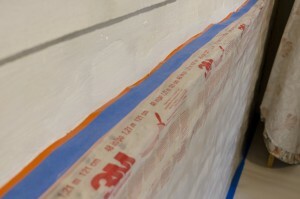 Tesa tape is orange which adheres to rough stone. The blue is the taped edge of the polythene sheet. 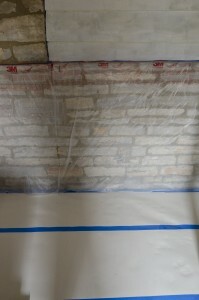 The floor was masked off with lining paper and Blue 3M tape. The stonework was masked with exterior Tesa tape which will adhere to stone. 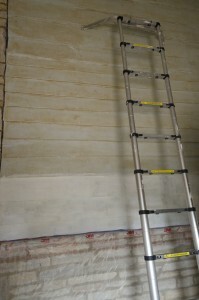 I used a 3M hand masker to apply the thin plastic sheeting to cover the stone wall below where I was working. The other advantage of Zinsser Bullseye Plus is that it can be recoated quickly so I decided to apply two coats to ensure the stain blocking properties were the best possible. Another benefit of this primer is it can be coated with any top coat, in this case Dulux Durable Flat Matt. This shows the extent of the stains on the upper part. The lower part is with first coat of Bulls Eye Plus primer. I applied the two coats of Bulls Eye Plus with a 2.5 inch Wooster Silver Tip brush. To the right of the photo after two coats of Bulls Eye Plus. 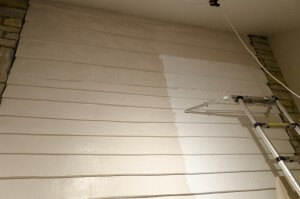 The upper and left with the initial coat of Dulux. A further full coat was applied. Note the telescopic ladder. This is very useful for working at different heights on the same project. A ladder stand off means the ladder sits away from the wall making access more comfortable. For the final coats of Dulux Durable Flat Matt I also used a 2.5 inch brush in. 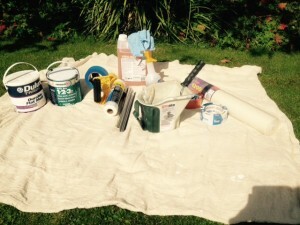 All the paints were decanted into a lined Wooster Pelican for ease of handling up a ladder. The Pelican benefits from a magnetic side to hold a brush and a small lip designed to rest a small roller, if required.